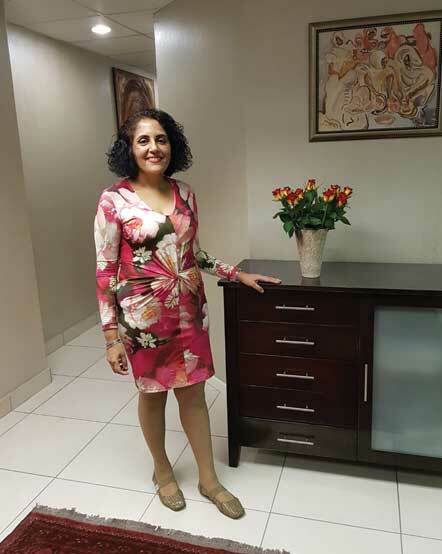 Dr Dilshaad Asmal is a female dermatologist practicing from Rondebosch Medical Centre and Cape Town Mediclinic. Dr Asmal belongs to the Dermatology Society of South Africa. The South African Dermatology Surgical Society and the African Women’s Dermatology Society. She is the only Dermatologist who is part of a panel for the Cape Advanced Wound Care Unit. She has a vast media profi le both in print, radio and television dating from 2010 to current. She has appeared on Hello Doctor, Doctor’s orders, Expresso, Afternoon Express, Elle magazine, Fairlady, Women’s Health, Men’s Health, You magazine, Kuier, Woman and Home, Edgars Club magazine, Media 24, Foschini magazine, Mediclinic magazine, Bona, Destiny, True Love magazines and on blogger’s platforms. The practice focuses on both paediatric and adult dermatology. Dr Asmal has travelled widely internationally to attend the best dermatology congresses to ensure that she is up to date on the latest international dermatological practices. The practice has a special interest in molemapping with the German Fotofi nder and photodynamic therapy for skin cancer. Dr Asmal also performs fractional laser and deals with pigmentation and other aesthetic problems together with a keen interest in medical dermatology. Rondebosch Medical Centre has an aesthetic practice – Rondebosch Aesthetics; that offers chemical peels, micro needling, together with Hyaluronic acid fi llers. The practice is managed by an excellent dermatologist who is passionate about dermatology. Current worldwide therapies are practiced to ensure that the patient gets the best possible care.